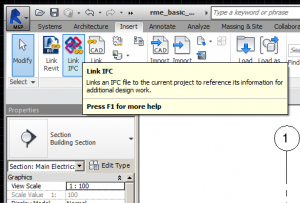 In Revit 2014 and earlier, you cannot import or link an IFC file directly. 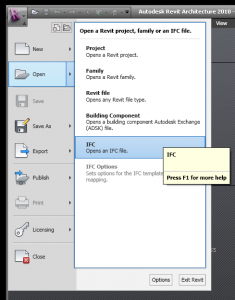 You must open the IFC file in Revit, save it as a Revit project, then link the Revit project. To do this, press the “R” button in the top-left corner to open the Revit menu. Expand the Open menu, then select the IFC command. The keyboard shortcut sequence for this is ALT+F, ALT+Y, ALT+I. Select the IFC file you want to import. After the IFC file is imported, save it as a Revit file. You can now use this Revit file to check for collisions with other Revit files. In Revit 2015 and later, you can link an IFC file without having to convert it. Use the Insert->Link IFC command to link the IFC file. You can export ductwork to an IFC file for collision detection in Revit using the Export to IFC File commands. This training video teaches you how to prepare your Design Master HVAC drawings for 3D coordination. 3D blocks can be assigned to Design Master entities using the Blocks List customization command for the type of entity.